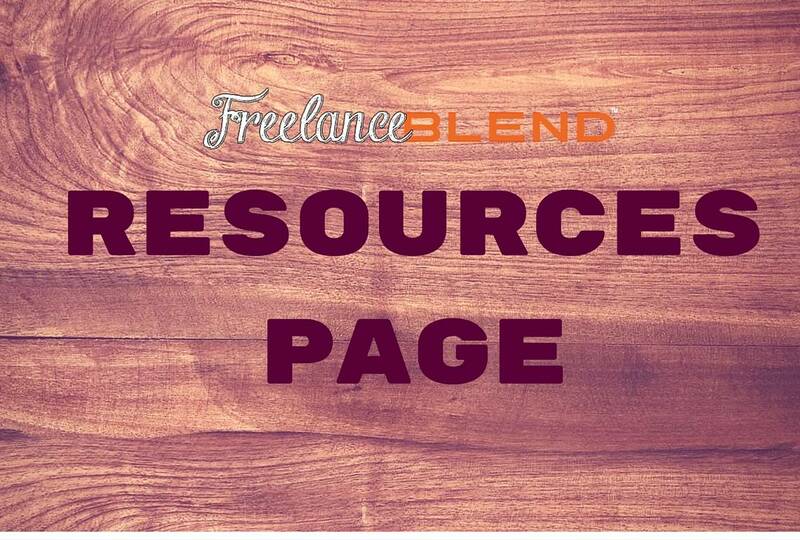 As freelancers, we don’t have many valid IDs available to us during the times that we need them. Comparing ourselves with our corporate counterparts, they have their SSS and company ID’s automatically given to them by their employers. 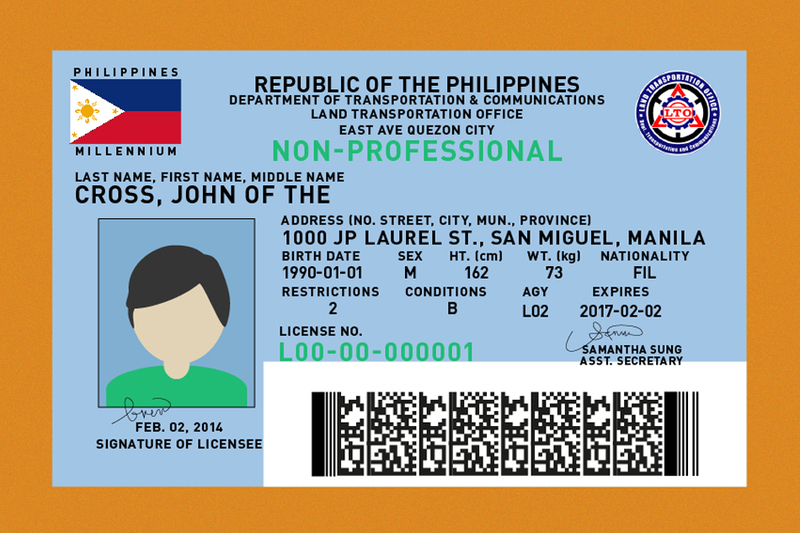 One of the most common and most important valid IDs here in the Philippines is the Driver’s License. A Driver’s License is one thing that you should always have in your wallet, even if you are not a driver, especially for the cases mentioned above. Now, renewing a driver’s license is not a walk in the park. 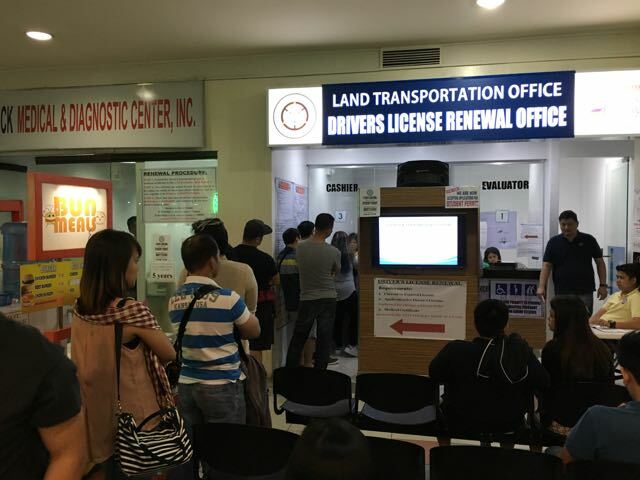 Although the Land Transportation Office (LTO), the government body responsible for issuing the driver’s license, has extended its expiration from 3 to 5 years, renewing the Driver’s License has traditionally been a pain. 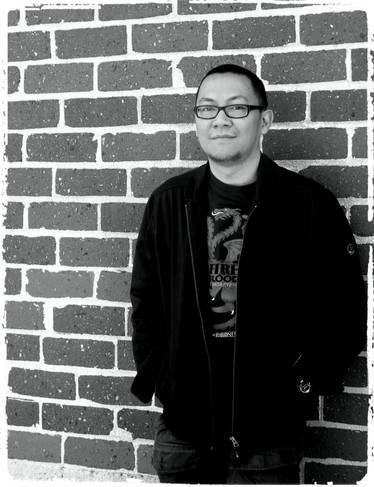 Since I started driving 20 plus years ago, I have had my share of bad experiences — from waiting more than half a day, to the computer system crashing, to waiting under the heat of the sun, and to dealing with annoying fixers. But those days are almost now gone as the current and past administrations have been slowly fixing and streamlining the renewal process. 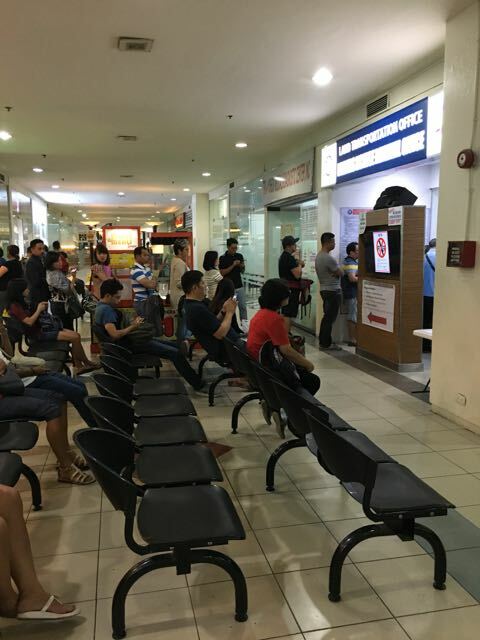 And I was glad to experience a painless renewal process at the LTO branch in Robinsons Galleria. 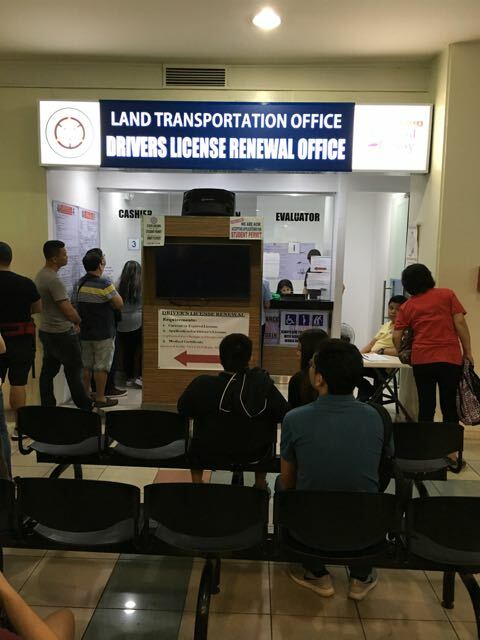 The LTO Drivers License Renewal Office inside Robinsons Galleria Mall. Now, just to be clear, this is my personal experience and I am not guaranteeing that this will be the same for you. The LTO branch is conveniently located inside the Robinsons Galleria mall, so you know that you will not be sweaty and basking under the heat of the sun. The mall opens at 10am and so does the LTO branch. Since I wanted to be over and done with quickly, I was at the mall way before 10am (thank God for Starbucks). 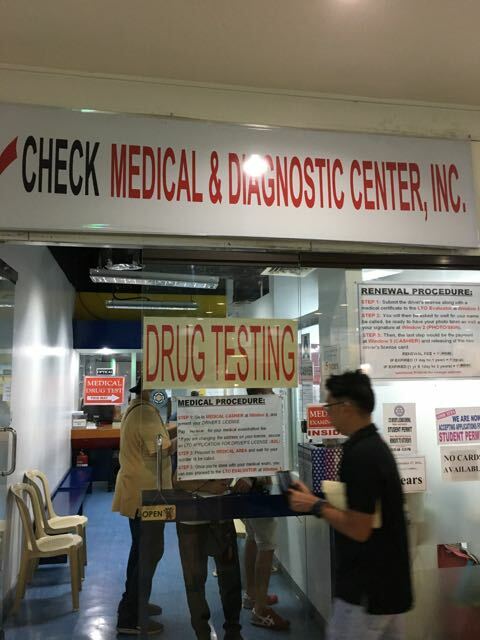 When the mall opened, I rushed to the ground floor of Robinsons Galleria and went first to the medical exam area right beside the LTO office. 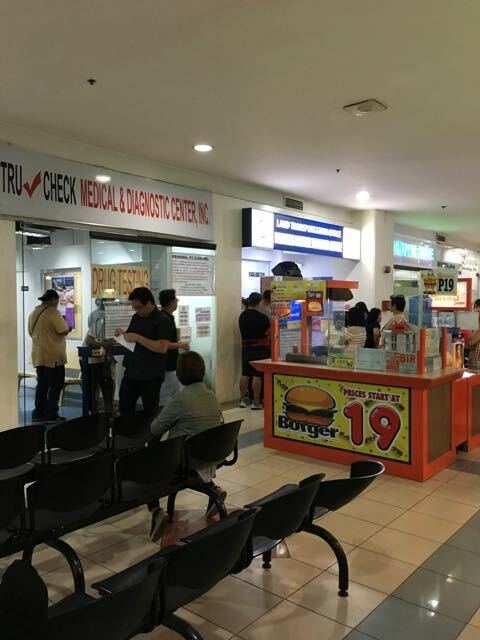 The medical diagnostics center and LTO Branch are beside each other. And you know what…I was the first in line. Wohoo! So I paid the P350 medical exam fee and waited for just about 10 minutes and I was called for the medical exam. The exam involved just checking my eyesight and getting my blood pressure reading. It was over in 10 minutes. (They actually removed the questionable drug testing procedure where you are asked to submit a urine sample). 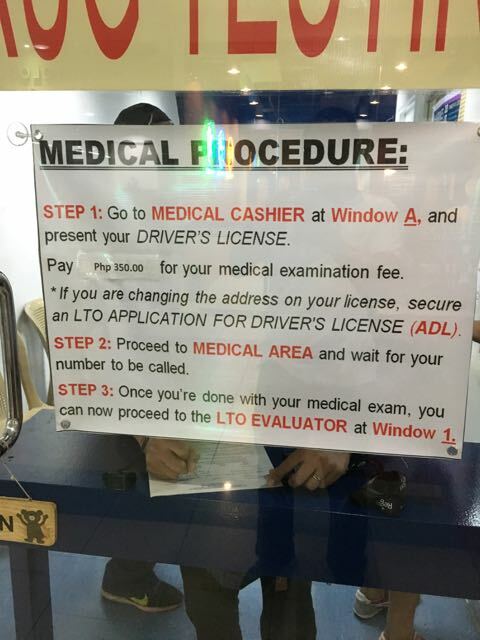 The medical exam procedure signage. 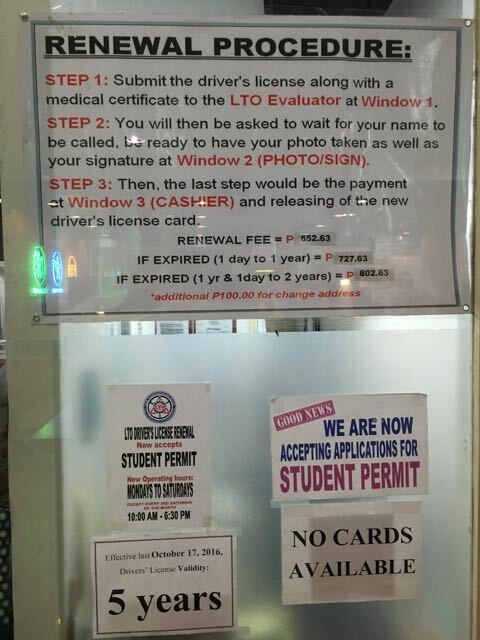 When that was done, I went to the LTO Evaluator in Window 1 to present my old license and a receipt from the medical exam office. I was asked to wait for my name to be called. I waited for about 15 minutes, then my name was called by Window 2, where my photo and digital signature were taken. It took just 2 minutes. Windows 1, 2 and 3. Rows of chairs in front of the LTO branch. Now, although I was the first in line, LTO gave priority to a pregnant lady, which was totally fine with me. Thus, I waited for another 15 minutes, and my name was called by the cashier at Window 3. 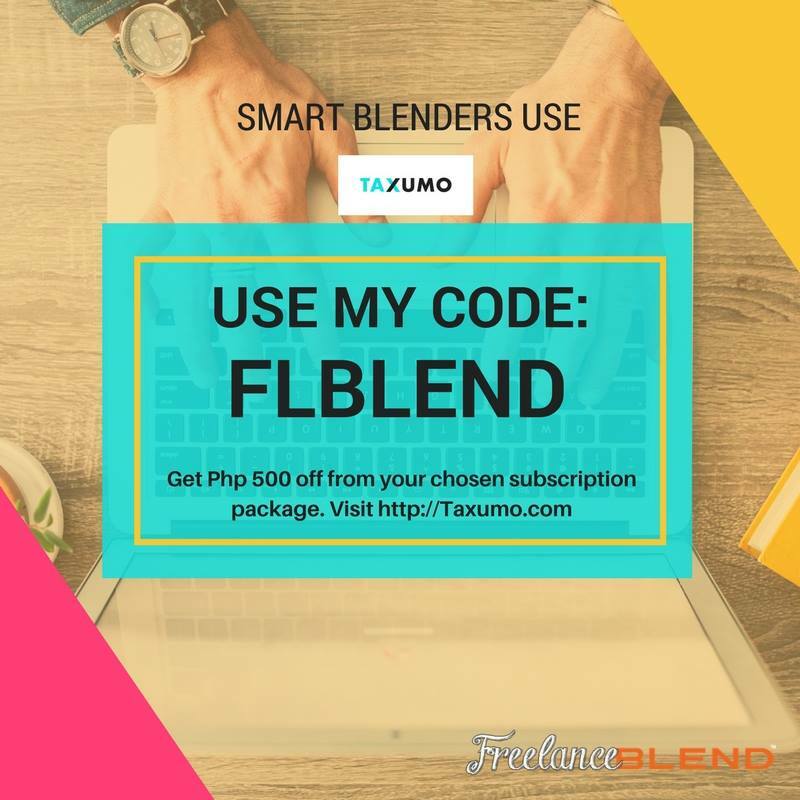 I paid the total amount of P727.63, which is composed of the license fee of P585.00, penalty of P75 and computer fee of P67.63 (the penalty was for being late by 10 days and the amount will be the same if you are late for 1 day to 1 year). The cashier gave me an Official Receipt and gave me back my old license (OR below is just a sample and it’s not mine). 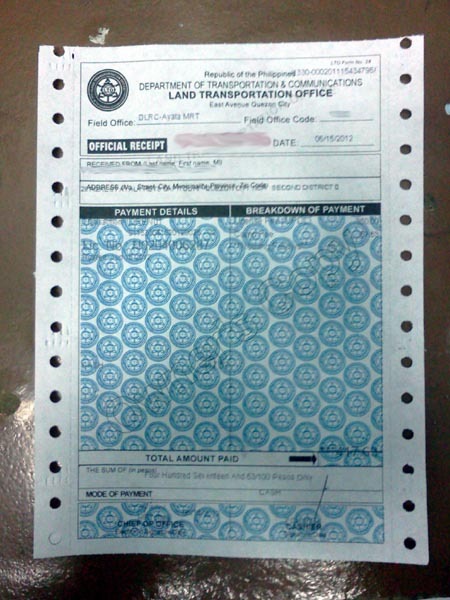 Sample Offcial Receipt from the LTO. They said the OR will serve as my temporary license until the actual card is released and gave me a telephone number to call to follow up on the card. That was my driver’s license renewal experience which took less than one hour, in the most convenient fashion. 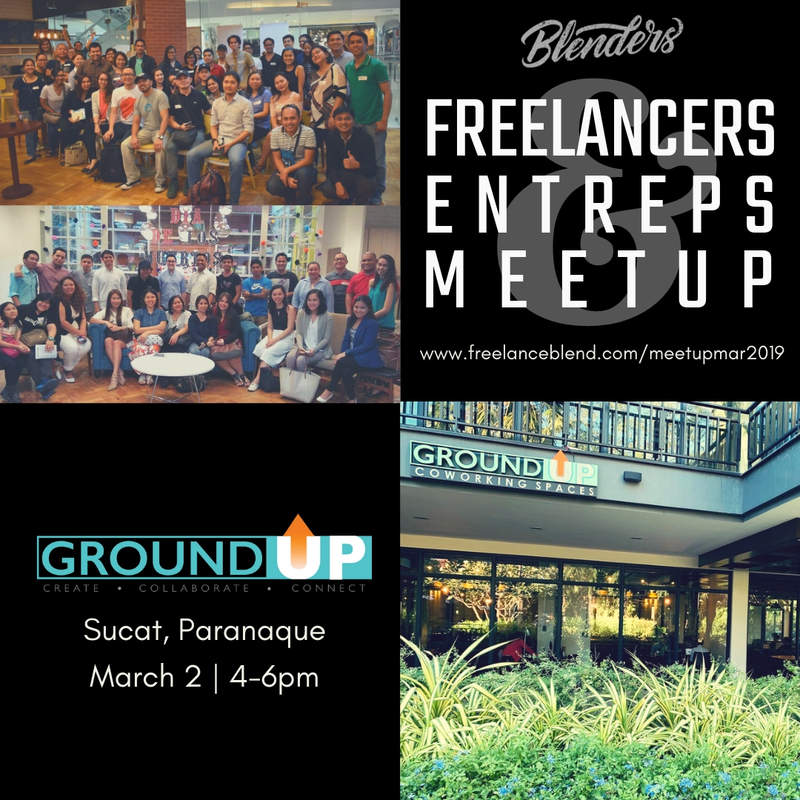 Just to give you an idea, 2 months ago, I took my wife to an LTO office in Paranaque, and it was very far from my experience in Galleria. The wait was 3 freakin’ hours, the office was packed with people, air conditioning was bad and there was no distinct queueing system. 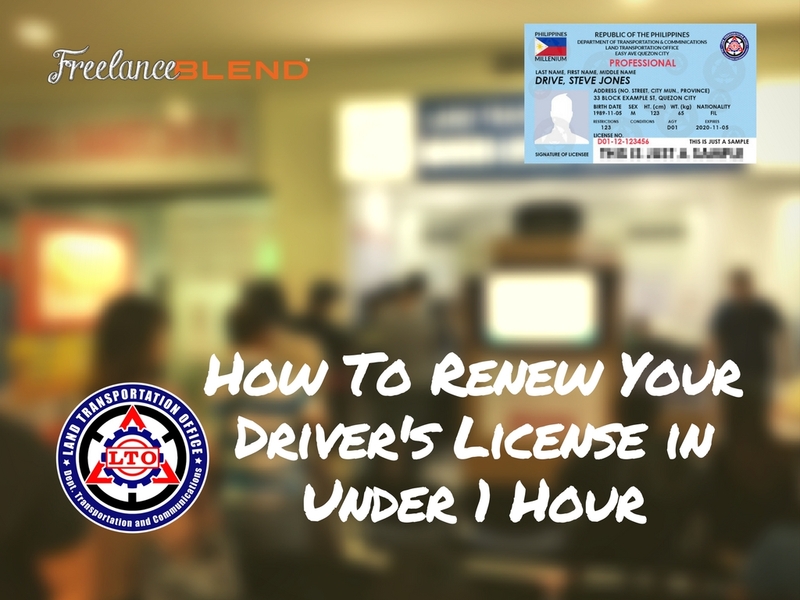 That’s why I believe that my personal LTO experience was the best so far and I hope that this will serve as a guide for you when your renewal time comes. 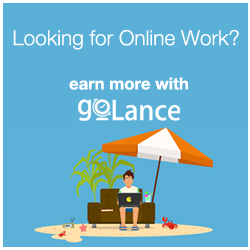 Do you think your LTO experience is better than mine? 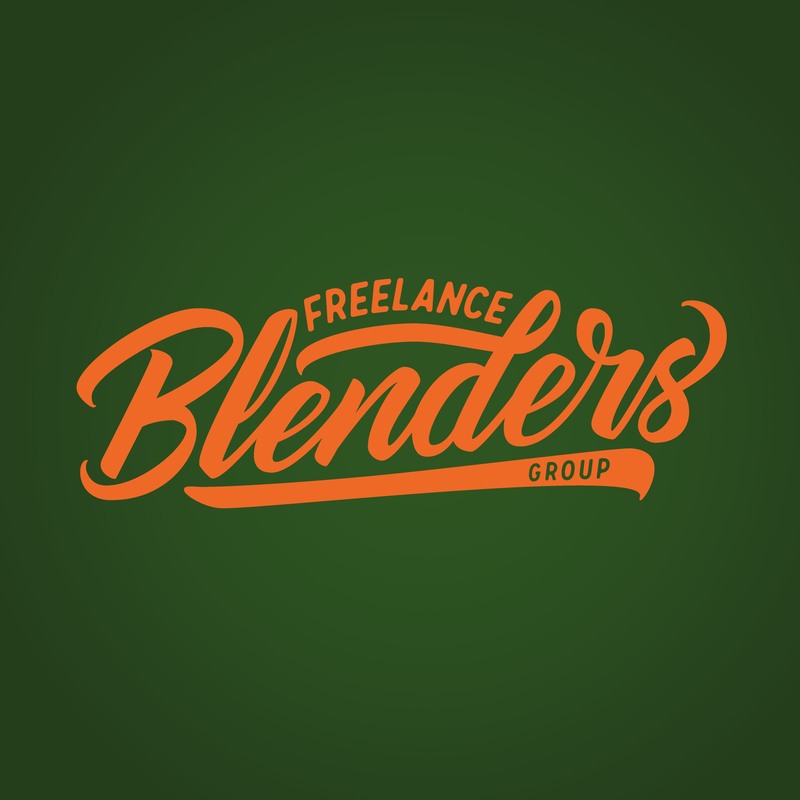 Please share in the comments box below.